You know the saying "There's more than one fish in the sea." It's that time of year when fish start feeling the love. This is a wonderful time of year when a new cycle in nature begins. To get a closer look we went to Birch Aquarium at Scripps to catch the intimate moments. It's dating and mating season for animals everywhere. You may be surprised how love connections are made under the sea. Take, for instance, switching roles in parenting. "This is the time when sea horses start breeding more and I just love the sea horses because it's the males who give birth. They actually have a pouch, the males and females put the eggs in the pouch and the male looks after them," Birch Aquarium Executive Director Nigella Hilgarth said. But not all mating is sweet. Some fish like to take a bite out of love. "Courtship in sharks can get a little rough sometimes they actually bite each other. It's a sign of affection that they like each other. Isn't that amazing," Hilgarth said. Taking care of the nest is a full time job for the Garibaldi. If you get in between this orange guy and his future offspring, you'd better be ready for a fight. 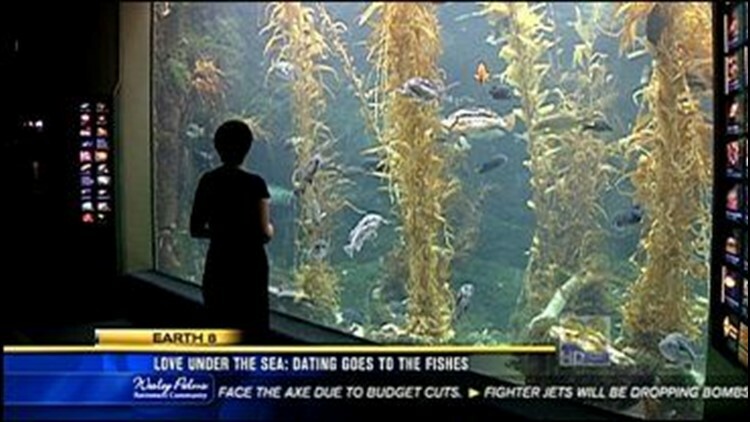 Just stand in front of the giant kelp tank, and you can get an idea of what happens when nature calls. "We are really a world renowned for conservation breeding programs of ocean critters, including the sea horse program, jelly fish program and even our coral propagation program," Hilgarth said. To see more mating and nesting in action, visit Birch Aquarium at Scripps, where they have a nursery exhibit on display. For a limited time during spawning season, be a part of the grunion run led by naturalists.